Solar Wind Constantly bombards the Earth (coming from the Sun at left of pic). God created the Earth's Magnetic Field to protect us from their harmful effects. Some Solar Wind, however makes it into our upper atmosphere at the North and South poles where the Magnetic field is shaped like an apple core. Here it is only allowed to display awesome light effects in the Sky. There is something else you should know about solar wind. There are magnificent light displays that occur high in the sky at the north and south poles. These colored lights are known as auroras or Northern and Southern Lights. At the North and South Pole, there is a strong magnetic pull that actually causes the ozone layer to be more of an apple shape instead of being perfectly round. This magnetic pull draws in some of the solar wind into the upper layer of our atmosphere, and when the solar wind particles meet the earth's atmosphere they light up creating the auroras. In our scenario, this magnetic pull represents the desire (void) that we all have that only God can quench. 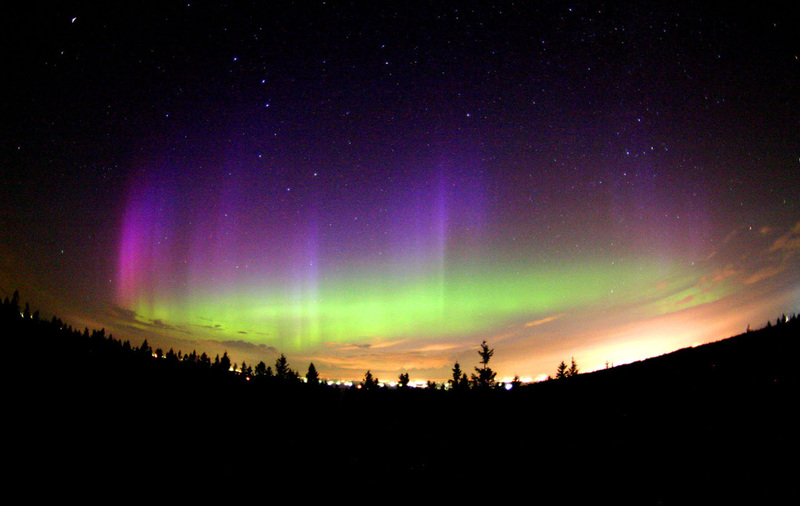 theNorthern Auroras, Symbolic to the way we are called to be a 'Light' to the world. Now we all know that there are many different ways to reach out to people. Some are straight forward, some pass out tracks on street corners, some pray (intercession), and others are pastors or youth workers. But, all in all, however God calls us to minister to unsaved people; we all hope that some light will be shed within that person’s heart. We hope that some how we are getting through. But, most of the time the earth that we are ministering to has built up a resistance to the sun and its righteous rays. With this ozone layer up, most of the solar wind is deflected away from the earth. But there is that solar wind that is able to penetrate that 'fleshly' defense and bring forth light. The beautiful thing that God revealed to me that day as I sat in my high school science class, was to be that solar wind that is able to pierce the shield of the iniquitous we must use a spirit of discernment. The person(s) that we are called to bear witness to can see the truth bearing light of the Son (sun), but they have spent their existence living in the dark. The darkness that they have grown to accept nurtures and lies to them, causing them to be sensitive to the light. They build a defense against the son and his solar wind because their eyes have been staring into the dark for so long. That is why the first gift that God desires to give us to effectively evangelize and defend the faith is a healthy sense of discernment. Then, we can see things from the perspective of the person(s) that we are bearing witness to and create in them a curiosity that will draw in them a craving to learn about and live by the truth of God's word (the bible). So, in its most basic form, the Solar Wind theory is just a name given to this visual reference (from our Father's creation) that vividly illustrates God's plan for ministry. All of us who claim the redeeming blood of God's Son were once bitter towards the Gospel. And we, like the earth, built up a defense to protect us from the light. But, even that wicked defense could not stop the desire (magnetic pull) that we all have to find true joy. And for this reason the Son (sun) of God sent out his faithful followers (the solar wind particles) to give an account of the everlasting love of the Father God. But, in a more applicable sense, the Solar Wind theory is a set of guidelines that we could add to our ministering/ministries/evangelism that might help us be more effective in our outreach.